The longer the landscape makeover dragged on, the hotter the season got (wouldn't you know that the previous spring was long and lovely but this one was short and progressively hotter). I was starting to panic - it was soon going to be too hot to plant! How could I put a bunch of young plants in the ground in summertime? I wasn't used to that, having always tried to get all planting done before the swelter season started. In the photo above you can see the bones of the deck, an edge of the rock wall to the left and then nothing except my forlorn and falling down portable greenhouse. 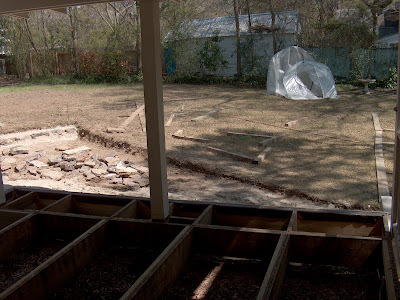 In the photo below you can see the four 8'x8' square beds, the gravel paths between them, and the area where the lawn was not yet in. It's now late April of 2006 when this photo was taken. Although the irrigation system was not yet in and lots of things were still to be done, I couldn't wait any longer. I went to the nursery, bought lots of small flowers and herbs and placed them around the beds to mull the placements over. 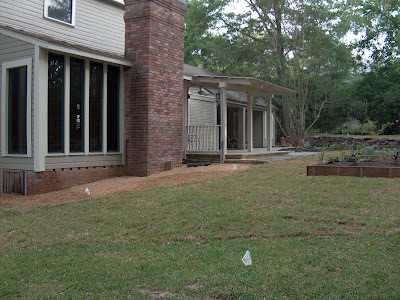 The photo below shows the plants in place along with the lawn. I was so happy to experience a really easy planting experience since the "brown gold" was so nice and fluffy. You can also see a peek of the bluestone in front of the deck. Note also the truly ugly fence and falling down garage of my neighbors'. I suppose you could consider the garage a rather quaint country artifact except for the blue plastic that was holding the backend together! You also might detect that there are far fewer plants along the back than in the first picture. I wanted a few dead and/or invasive plants taken out of the back so I tagged what to remove for the contractor. Lo and behold his crew went ahead and removed EVERYTHING except the trees. This view is from our kitchen door. I mentioned in my last blog how one of the goals of the makeover was to reveal the house. Below you can see how that was accomplished. All the plants around the foundation were removed and a gravel area bordered by 2x6's (I think) was installed. I really like this look and the gravel area near the porch and water faucet has become a nice area for potted fragrant plants. 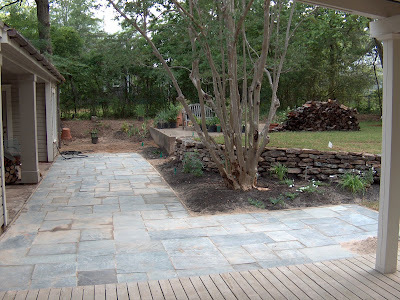 Below is a photo of the bluestone patio and walkway just after it was completed. At the end of that walkway we tried to solve the drainage problem by installing a french drain under a gravel area as well as installing new gutters off the carport roof. In fact, we had to install gutters around the deck roof as well since we didn't want tons of rain hitting the bluestone in front of the deck. In front of the rock wall I transplanted some of the older daylilies and other flowers I thought would do well. This area has proved to be a tricky one though. That's because it stays much wetter than I'd like because of the drainage from the land above it. The tree you see is an old gnarly crepe myrtle. I don't mean gnarly in a disparaging way but rather that it has tons of knots on it. I believe it received some rather crude pruning at some point in it's life and that's why it's full of knots. 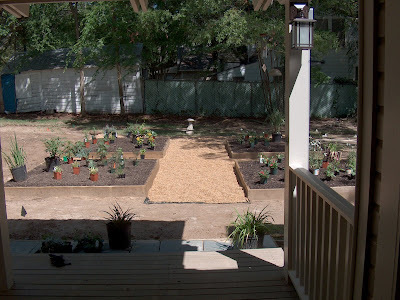 In my next post I'll show the garden in its more mature form as well as the fence and stairs we installed. :-) Yes, the bluestone pavers were probably one of the biggest surprises to me about the whole project. I didn't realize initially how much impact they would really have. Wow you have done a ton of work in your yard. Looks great! Very nice! 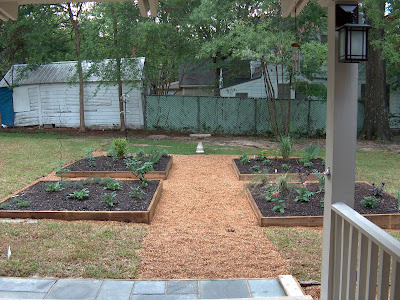 The raised beds look great as does the retaining wall and patio. i love those crape myrtles with character!